Zygomatic implants* are the alternative to conventional implants when there is a loss of supporting tissues (bone, gums). The most common reasons why patients visit our clinic are the following: the loss or absence of teeth, a loss that causes difficulty chewing or aesthetic problems. If the tooth loss happened some time ago and afterwards the patient used a removable device, a loss of support tissues (bone and gum) may occur. In the future this problem can affect the placement of dental implants because in order to place them correctly a sufficient amount of bone is required to fix them well. In these cases we are making reference to patients with little bone left. 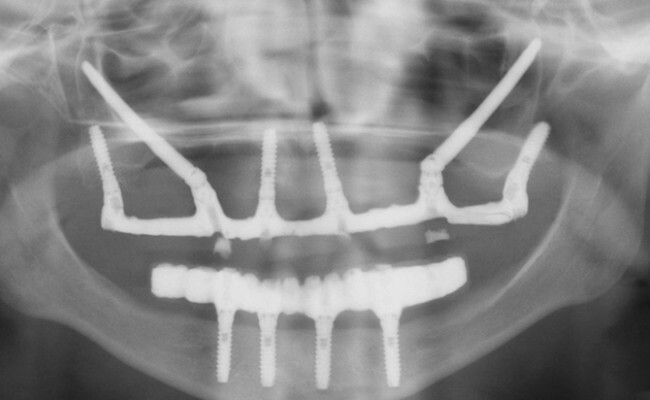 For all the reasons mentioned above the zygomatic implants and the tilted implants can be a great alternative for patients who have little bone left and are discarded for the placement of implants due to this problem. We have come across cases of patients who have lost many teeth many years ago and there is insufficient bone to place dental implants. These situations are a challenge for the implantologist, especially in the case of the teeth of the upper jaw. An optional treatment for patients who have lost all their teeth in the upper jaw and have little bone left are the zygomatic implants. 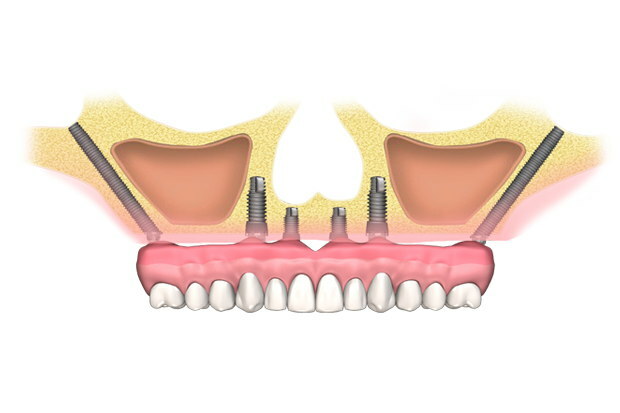 This procedure combines the placement of implants in the zygomatic bone as well as the placement of dental implants in the rear area of the jaw. The zygomatic implants surgery is a safe and moderately simple procedure and is often done with general anaesthesia for the comfort of both the patient and the implantologist. The zigomatic implants technology is an alternative treatment for patients with atrophic jaws, resorption of the jawbone, jaw imperfections or in case of a loss of an implant. The success rate is between 94 and 100%, which makes this treatment an excellent option in case of full oral rehabilitation for patients with severely resorpted or atrophic jawbones.